Any resemblance to an iconic film by Steven Spielberg is mere coincidence: a citizen of Lebanese nationality is stranded for a month and 12 days at the José Joaquín de Olmedo airport, in the city of Guayaquil, on the coast of Ecuador. The man, identified as Nizam Hussein Shalak, sleeps on a makeshift bed, with pillows and blankets, between the seats of the airport's international departure lounge, as in the film 'The Terminal' starring Tom Hanks, local newspaper El Universo reported. Shalak, 56, eats thanks to the coupons that sometimes the airline that is in charge provides him; and shower every three or four days in a bathroom located in another part of the airport, when they give him access. The Lebanese was in Guayaquil a little over two months ago, as a tourist. Returning to his country, he made a stopover in Lima, Peru, and then in Barcelona, Spain. When he reached that last point, he discovered that he had lost his passport and could not continue. At the Barcelona airport he stayed for 10 days, while he waited for a solution, and the result was that he was sent back to Lima. In the Peruvian capital was another 11 days, sleeping in the transit room. From that city he was sent back to the city from where he began his return: Guayaquil. The Lebanese, who has not requested protection or asylum according to a source from the Foreign Ministry, requires a safe-conduct from the authorities of his country to leave Ecuador. The Ecuadorian chancellery said that Hussein Shalak remains in the airport in a situation of inadmissibility due to lack of documents. "Having not legally migrated, he is not in the country. The only competent body to issue a travel document is the consulate of Lebanon in Bogota, which has not responded to the various insistences to do so," affirmed that organism. It added that the efforts of the Ecuadorian authorities are focused on getting Lebanon to issue a travel document so that he can return to his country. But the Lebanese authorities have not offered an answer. "We have no comment on the matter," said a woman from the Lebanese consulate in Quito, who was consulted by telephone by the AFP, who identified herself as an "official." The foreigner says he feels exhausted by the situation and asks the authorities to help him. Billy Navarrete, president of the Permanent Committee for the Defense of Human Rights, said that the Ombudsman's Office, on Tuesday, presented the case of Shalak before the Human Mobility Board. He points out that they have tried to contact the visitor, but access to the place where he stays is complex. Navarrete does not know exactly from when the Ombudsman knows the case, but assures that he would be looking for a translator and a contact with the Embassy of Lebanon in Bogota. "We have to look for a humanitarian exit," he says. 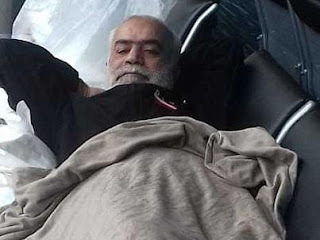 The situation of this foreigner resembles also that of an Iranian refugee who lived at the Paris airport between 1988 and 2006 and was portrayed in the film "The Terminal" starring Tom Hanks, said El Universo. He does not speak Spanish. Travelers and staff working in airlines have noticed his presence and with the help of Google's translator have managed to communicate with him. His case is in the hands of the Ministry of Foreign Affairs and Human Mobility of Ecuador. Carlos Estarellas Velasquez, an international analyst, considers that in this case, the Ministry of the Interior had to communicate with the honorary consul of Lebanon in Guayaquil. In his opinion, it must have issued a safe conduct for Shalak to return to his country. "You can not stay more than 15 days that means they're not doing anything. It is terrible, a violation of human rights," he says. For him, there is inoperability of the Foreign Affairs authorities and the Ministry of the Interior.